April 10 is Equal Pay Day in 2018, a day that symbolizes the size of the gender pay gap. The day exists to showcase how far the average woman must work into the next year to earn what the average man earned by Dec. 31 of the previous year. It’s unsettling and we aren’t celebrating just yet. The date has been shifting year after year. In fact, last year the day was on April 4, 2017, six days earlier, and two years ago it was on April 12, 2016, two days later. The Equal Pay Act was signed in 1963, but very little progress was made. In 1996, the National Committee on Pay Equity established Equal Pay Day to bring awareness to the fact that women are still being underpaid. On average, women make 79 cents for every dollar a man makes. But those numbers change based on demographics and a variety of factors such as your industry and profession. In 2016, Canadian Women in Public Relations collaborated on the very first international Gender Pay Gap and Work Life Balance Survey, with sector group Global Women in PR, which revealed a Global Gender Pay Gap of £12,600 GBP ($21,174 CDN) in the PR industry. In addition the survey revealed that men (36%) are more than twice as likely as women (16%) to reach the PR boardroom; that women have real confidence issues about asking for a promotion or pay raise and that balancing child care and work commitments is challenging for both parents (73%), but especially women (78%). In 2017, Canadian Women in Public Relations and American Women in Public Relations together announced the annual gender pay gap survey results with Global Women in PR. The results revealed that although women represented two-thirds of the global PR industry, 78% of the CEOs in the top 30 PR agencies worldwide are men and they occupy 62% of seats at the PR boardroom table. The data collected highlighted the fact that very few PR women make it to the top of the profession. Comparing like for like, the average salary for men in PR is US $61,284 (CDN $76,365) compared to women US $55,212 (CDN $68,799), revealing a gender pay gap of US $6,072 (CDN $7,566) in 2017. In 2016, our results revealed a gender pay gap of $21,174 CDN, which demonstrates that the gap is starting to shorten in our industry. However, there is still lots of work to be done. When asked if they think they will reach the top of the career ladder – 28% of men believe they will ‘definitely’ get there, whereas only 18% of women believe this. The wage gap will continue to persist until we get more women in PR moving into senior leadership positions. Ironically, many Americans are still more likely to say they would prefer a male boss (33%) to a female boss (20%) in a new job, according to a Gallup survey. Many executives are involved in hiring and salary decisions and generally earn more money. However, the PR workplace does not appear to be more gender equal as we get older – 36% of women believe the PR industry is ageist, compared with 25% of men. The reasons for the gender pay gap are complex and it’s been a research topic for decades. Women that have cracked the glass ceiling are sharing how they have done it and politicians across the America’s are promising to close the pay gap. The gender pay gap isn’t new and it’s not unavoidable. We need to take action to implement solutions to ensure that women are not missing out and they are earning what they are worth, particularly in the PR field. One theory about why gender pay inequality still exists is that women don’t negotiate their starting salaries as much as men. This is important because the way that you negotiate your salary will have a long-term impact on your earning potential and future pay raises. To help change this, Google reportedly bases its salaries on the market rate for a specific job, rather than an employee’s previous salary and Reddit announced that it will no longer allow job candidates to negotiate salaries. One noticeable finding in our Women in PR research study was the confidence gap. Twice as many women (26%) say they are ‘not confident’ asking for a promotion or pay rise, compared to 13% of men. While men often feel ‘supported’ to speak up about their work, women fear rejection. However, in order to close the gender pay gap, we need women to speak up about the value of their PR work to an organization. Especially in the PR field, communicating your worth will give you greater visibility, which will help to drive confidence. “Women dominate the mid-level PR ranks, doing much of the day-to-day heavy lifting, and women are more often in command at smaller-size agencies that they have founded,” explains Wendy Marx in her article for Fast Company. While the PR profession is heavily female and many women own smaller PR consultancies, women entrepreneurs are far less likely to hire people to help them. They are sending a message that they are fine with doing all of the work by not delegating as a business owner. This is detrimental to their success as they are not showcasing their true PR talents by doing ‘busy work’ and not focusing on making more money. To help combat the gender pay gap, both men and women need to be more transparent about what they earn in the PR field. For example, Kaitlin Menza at The Cut, asked people with the same job title to share their salaries with each other. “It’s one thing to say that you want equality with your colleagues, and quite another to put that number out in the open,” says Menza. She asked two senior editors at different magazines at Hearst to share their salaries. The government also needs to take action to address the gender pay gap. In Ontario, Canada, the government introduced Bill 2013, Pay Transparency Act, 2018 (“Bill 203”). The Bill will create certain requirements for employers regarding compensation information and its disclosure to employees and potential employees. If passed, the legislation will come into force on January 1, 2019. In the United States there are several laws that mandate equal pay for the same work. However, despite these laws, pay inequality still exists. One way that Women in PR are helping to close the gender wage gap is by hosting events that bring women together to help each other take action. Specifically, on February 28, 2018 our organization hosted a strategy session to facilitate a discussion about how to be more profitable in your PR career. We shared our research about what women in our field are currently earning and how much women should be charging as a PR Consultant. We also disclosed a few ways that PR business owners can get more clients. This data is available on our member’s portal. We also have a business development course available on our PR training site. Part of the gender pay gap progress we have made is worth celebrating and we are making a difference by having these conversations, but we aren’t cheering just yet. Over the course of a woman’s PR career, women and their families are being shortchanged. According to the Wage Project, it’s costing the average woman between $700,000 and $2 million. According to United States Census data released in September, the gender pay gap shrunk for the first time since 2007. The gap is even more pronounced for women of color. February 22, 2018 — On this date, Asian American* women made as much as white, non-Hispanic men did in 2017. April 17, 2018 — Next week, white women will make as much as white, non-Hispanic men did in 2017. August 7, 2018 — Black women finally reach their “Equal Pay Day” when compared to white, non-Hispanic men. September 27, 2018 — Native American/Indigenous women will finally make as much as white, non-Hispanic men. November 1, 2018 — This final date marks Latina Equal Pay Day. Women in Public Relations hosted an event based on the Harvard Business Review report: The Hidden Brain Drain: Off-Ramps and On-Ramps in Women’s Careers. You can watch the discussion through our PR training site and it’s also available on our members portal. Through our research, we determined that in public relations, there is a trend of women starting their own consultancies to manage career and family obligations and enjoy a more flexible lifestyle. There are legions of professional women who step off the career fast track at least once to raise children, care for elderly parents, or manage other demands. But when they’re ready to step back on track – just a short time later – they hit a wall. On-ramps are few and far between, and the financial penalties for taking a “time out” are punishing. The result? Many women are lost on re-entry, and companies are missing the chance to leverage this talent pool. There are too many talented women leaving their careers for a change, or languishing on the sidelines. Our survey data demonstrated that a large majority of talented women have taken a career off-ramp or have nonlinear careers. In fact, 72 percent reported taking a voluntary time out from work for an average of 1- 2 years. The majority of these women were between the ages of 30 – 39 years old, with either a Bachelor’s degree or Graduate degree. This is a key age in determining a woman’s future career path. 60 percent took time off for child care, 40 percent took time off to pursue further education and another 40 percent indicated they no longer found their work satisfying. 90 percent indicated they would change career paths to find enjoyment from their line of work. In addition, these assessments were reflected in a survey Maclean’s and Insights West conducted to gauge public attitudes on the gender wage gap. 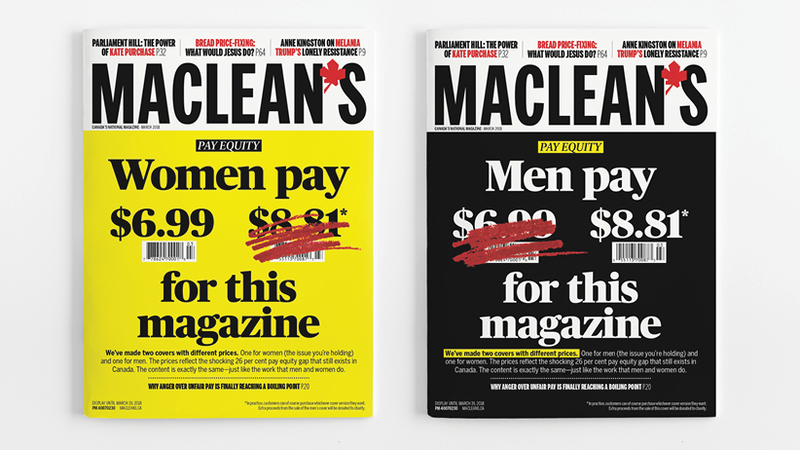 This month, Maclean’s has created two covers with two different prices—one at $8.81, the other at our regular price of $6.99—to reflect the 26 per cent gap between full-time wages paid to men and women in Canada. We are seeing progress from both women and men becoming more transparent about their salaries and companies are limiting room for negotiation by simply paying the market rate. However, it does nothing to ensure that women are represented at different job levels and are moving into leadership positions where the real decisions are made. Until this happens, we won’t be celebrating equal pay day, we will be getting ourselves organized because there is still work to be done. You can support Women in Public Relations by sharing this article on social media, reposting with proper attribution on your website and becoming a member of our organization.